Two members of Congress earlier this month introduced legislation advancing a food reform movement promising to help resolve the great environmental and nutritional problems of the early 21st century. The intent is to remake the agricultural landscape to look more like it did decades ago. But unless the most basic laws of economics cease to hold, the smallholder farming future envisioned by the local farming movement could jeopardize natural habitat and climate change mitigation efforts, while also endangering a tenuous and temporary victory in the battle against human hunger. The “Local Farms, Food and Jobs Act” sponsored by Senator Sherrod Brown of Ohio and Representative Chellie Pingree of Maine, throws about $200 million to local farm programs. That’s a rounding error in the $3.7 trillion federal budget. But the bill follows on a federal rule that gives preference to local farms in contract bidding for school lunches. It also builds on high-profile advocacy by Michelle Obama, who has become a leader of the food reform movement, joining the likes of Michael Pollan, the author of The Omnivore’s Dilemma, and famed-chef Alice Waters. The bill’s introduction came as the world population hit 7 billion, a milestone that provides a stark reminder of the challenge agriculture faces to feed a world population expected to grow to 9 billion by 2050. Experts estimate that in the next 50 years, the global food system likely needs to produce as much food as it did in the previous 10,000 years combined. Amid heightened concern about global climate change, it has become almost conventional wisdom that we must return to our agricultural roots in order to contain the carbon footprint of our food by shortening the distance it travels from farm to fork, and by reducing the quantity of carbon-intensive chemicals applied to our mono-cropped fields. But implicit in the argument that local farming is better for the environment than industrial agriculture is an assumption that a “relocalized” food system can be just as efficient as today’s modern farming. That assumption is simply wrong. Today’s high crop yields and low costs reflect gains from specialization and trade, as well as scale and scope economies that would be forsaken under the food system that locavores endorse. Economists have long recognized the welfare gains from specialization and trade. The case for specialization is perhaps nowhere stronger than in agriculture, where the costs of production depend on natural resource endowments, such as temperature, rainfall, and sunlight, as well as soil quality, pest infestations, and land costs. Different crops demand different conditions and vary in their resilience to shocks. So California, with mild winters, warm summers, and fertile soils produces all U.S.-grown almonds and 80 percent of U.S. strawberries and grapes. Idaho, on the other hand, produces 30 percent of the country’s russet potatoes because warm days and cool nights during the season, combined with rich volcanic soils, make for ideal growing conditions. In 2008, according to the USDA, Idaho averaged 383 hundredweight of potatoes per acre. Alabama, in contrast, averaged only 170 hundredweight per acre. Is it any wonder Idaho planted more acres of potatoes than Alabama? Forsaking comparative advantage in agriculture by localizing means it will take more inputs to grow a given quantity of food, including more land and more chemicals—all of which come at a cost of carbon emissions. It is difficult to estimate the impact of a truly locavore farming system because crop production data don’t exist for crops that have not historically been grown in various regions. However, we can imagine what a “pseudo-locavore” farming system would look like—one in which each state that presently produces a crop commercially must grow a share proportional to its population relative to all producers of the crop. I have estimated the costs of such a system in terms of land and chemical demand. My conservative estimates are that under the pseudo-locavore system, corn acreage increases 27 percent or 22 million acres, and soybean acres increase 18 percent or 14 million acres. Fertilizer use would increase at least 35 percent for corn, and 54 percent for soybeans, while fuel use would climb 23 percent and 34 percent, for corn and soybeans, respectively. Chemical demand would grow 23 percent and 20 percent for the two crops, respectively. In order to maintain current output levels for 40 major field crops and vegetables, a locavore-like production system would require an additional 60 million acres of cropland, 2.7 million tons more fertilizer, and 50 million pounds more chemicals. The land-use changes and increases in demand for carbon-intensive inputs would have profound impacts on the carbon footprint of our food, destroy habitat and worsen environmental pollution. It’s not even clear local production reduces carbon emissions from transportation. The Harvard economist Ed Glaeser estimates that carbon emissions from transportation don’t decline in a locavore future because local farms reduce population density as potential homes are displaced by community gardens. Less-dense cities mean more driving and more carbon emissions. Transportation only accounts for 11 percent of the carbon embodied in food anyway, according to a 2008 study by researchers at Carnegie Mellon; 83 percent comes from production. A local food production system would largely upend long-term trends of growing farm size and increasing concentration in food processing and marketing. Local “food sheds” couldn’t support the scale of farming and food processing operations that exist today—and that’s kind of the point. Large, monocrop farms are more dependent on synthetic fertilizers and tilling operations than small polycrop farms, and they face greater pest pressure and waste disposal problems that can lead to environmental damage. d to more expensive food. A local food system would raise the cost of food by constraining the efficient allocation of resources. The monetary costs of increased input demands from forsaken gains from trade and scale economies will directly bear on consumer welfare by increasing the costs of food. And, as we try to tackle obesity, locavorism is likely to raise the cost of precisely the wrong foods. Grains can be grown cheaply across much of the country, but the costs of growing produce outside specific, limited regions increase quickly. Thus, nutrient-dense calories like fruits and vegetables become more expensive, while high fructose corn syrup becomes relatively cheaper. Finally, higher costs on certain foods may be a solution to the big health challenge in the developed world. But higher prices on any food are precisely the wrong prescription for the great health problems in the developing world, where millions remain undernourished. As the food crisis of 2007-08 revealed, winning the war on human hunger requires a constant commitment to getting more food out of less land, water, and other inputs. From roughly 1940 to 1990, the world’s farmers doubled their output to accommodate a doubling of the world population. And they did it on a shrinking base of cropland. Agricultural productivity can continue to grow, but not by turning back the clock. 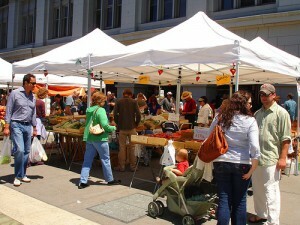 Local foods may have a place in the market. But they should stand on their own, and local food consumers should understand that they aren’t necessarily buying something that helps the planet, and it may hurt the poor. You mention math based on conservative estimates for corn and soybean production. Are you looking at only corn and soybeans used for human consumption? Or does this also take into account the corn that is used to make my toothpaste and gasoline? Also, an analysis of the top 40 crops is ridiculously low. There are over 5,000 varieties of potatoes worldwide (http://en.wikipedia.org/wiki/Potato), most of which are not grown in Idaho. You completely miss the point of the locavore movement emphasizing regional foods that used to be grown in a certain area. We will not feed Africa by increasing the crop yields of fields in Idaho. These types of criticisms will make much more sense, when it comes to efficiency and environment, once industrial agriculture becomes either efficient (monetarily and land per calorie) or environmentally neutral. "it will take more inputs to grow a given quantity of food, including more land and more chemicals"
I think this is telling of the author's perspective. He's focusing on the "local" part and ignoring the call for a holistic change in agriculture. It's easy to take down a locavore strawman, because localized food by itself doesn't make much sense. If you are truly eating local, you eat what can be easily produced locally in your region in a given season. Tomatoes are out of season? No tomatoes for you. It's how much of the world still eats. And chemicals? I don't know many locavores that would be happy with *any* chemicals on their food. So saying it will take "more chemicals" is completely missing the point. Finally, there is this assumption that food production must be scaled to its maximum to meet population demand. This idea is ridiculous if you actually think about it. Eventually the world population has to stop growing. It would be far better for the world if the population peaked at 10 billion than at 20 billion, especially if we can only feed 15 billion (that means 5 billion starve, if you're bad at math). Better that the cost of food go up now because we adopt sustainable practices and naturally reduce population growth than the alternative. Without access to birth control, I do not think that food costs are going to be effective at reducing population growth. The prospect of possibly dying from AIDS doesn't stop people in Africa from having kids (see: http://en.wikipedia.org/wiki/File:Map-of-HIV-Prevalance-in-Africa.png and http://en.wikipedia.org/wiki/File:Countriesbyfertilityrate.svg). Even with all the condoms in the world, raising food costs is going to lead to a lot more suffering than some pesticides and GMOs will. The problem with this argument is that you assume that farming practices would stay the same as they currently are. This is not the case. Since farms would be operating at a much smaller scale, they would have less need for the chemicals, fertilizers and other things that large operations need to use. The truth is, before industrial farming, these types of things just didn't exist and we didn't need them. At a smaller scale, transportation from farm to plate is reduced, the health of the animals and crops is increased, there is a reduction in pesticide use, and as a result the health and economy of the local population is increased. I'm sorry, but I'm not seeing anything negative about that. Have you read Michael Pollen's book, "An Omnivore's Dilemma" or seen movies like "Fresh!"? If not, I strongly suggest you do. The article is saying that in order to produce enough food locally, there would need to be an increase in the use of pesticides and chemicals because the area where that food is being grown is now less efficient than where it used to be grown. The reason "we didn't need them" before was because we were feeding fewer people and using more land to do so. If you want to go back 40 years, then you need to kill off about 100 million people and reclaim millions of acres of farmland. must be the end of the world. More farm subsidies. Beautiful. I swear the size of these guys' ba! !s nver ceases to amaze me. « Previous PostThe Italian Debacle and the "Church of 'Scionology'"